Hopefully I can keep this post a good deal shorter than the Knut Hamsun review – the trouble is, classic novels seem to have a symbiotic relationship with long, semi-academic introductions. 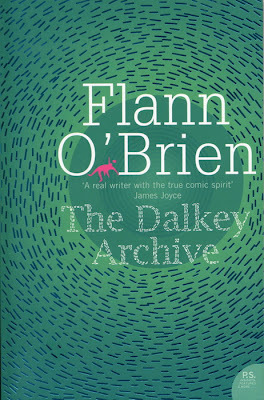 However, Flann O’Brien’s The Dalkey Archive isn’t a classic book, although you could say it’s written by a classic author. Flann O’Brien is probably my favourite Irish author, being as he was essentially a comedic Joyce. Not that James Joyce didn’t have his moments of levity, but he never exactly threatened to engulf the reader in hilarity, which is often what Flann O’Brien’s novels do. Flann O’Brien (real name Brian O’Nolan; forced to adopt a literary pseudonym due to his occupation as an Irish civil servant, he also wrote voluminously in newspapers under the even more ridiculous alias of Myles na Gopaleen) wrote in the middle of the last century, The Dalkey Archive being published in 1964 shortly before his death two years later. O’Brien was a gifted, creative and very funny novelist, albeit also an often drink-sodden one (see my previous contribution to literary theory here). Part travelling in the shadow of Joyce, part mired in his own bitterness and cynicism, his body of work nevertheless still stands out as some of the freshest and most original parts of Irish literature. So what is The Dalkey Archive? To my mind, it is the most accessible of Flann O’Brien’s works. The posthumously published The Third Policeman (which recently had its cult status re-ignited by a connection to the plot of Lost; I’m not a follower of that show, but I’d hazard a guess that that both works are probably equally as difficult to follow) while perhaps even funnier in its surreal fantasy, lacks the ordinary charm of The Dalkey Archive. And in comparison with his heavily Joyce-influenced 1939 debut, At Swim Two-Birds, The Dalkey Archive is eminently more readable. In a way, The Dalkey Archive is a detective novel, or at least a pastiche thereof. At the same time, it is a gloriously daft, surreal comic fantasy, not to mention an ingenious satire on Irish drama. Perhaps also it is a portrait of the old-fashioned world then to be found in Dalkey, a suburban village on the outskirts of Dublin city. Trams, priests and of course pubs abound. Variety and familiarity characterise this novel – variety, because of the comedy and surreal happenings of the novel, and familiarity because of the quintessentially Irish characters and cultural setting. It might help to mention here that three main characters in the book are, in order of appearance: De Selby, a mad scientist living in peaceful solitude by the sea in Dalkey; Sergeant Fottrell, the senior policeman in the village with deep metaphysical suspicion regarding bicycles (see below); and Joyce himself, not dead but living an anonymous existence in the rather unexciting tourist resort of Skerries, some way north of Dublin. These excellent comic sketches revolve around the comparatively straightforward protagonist; ‘Mick’, an abstemious, earnest young civil servant and heavily ironic alter ego of the author, whose devious interference in disparate and rather implausible events only adds an extra gloss to the intricate humour of the novel. In short, The Dalkey Archive is a cheerfully daft yet breathlessly readable novel of madcap happenings in an archaic, though not entirely dated culture. The extract below, I hope, should give an indication of the genius of this book: it seems, even to me, to be difficult in this dialogue to distinguish the typical Hibernian idiom from the daft (and arguably even more typically Hibernian) surrealism. Believe me, Irish people do, or at least once did, actually talk like this… particularly when they had ‘a drop taken’, as they say! The sergeant beckoned the waitress, ordered a barley wine for himself and a small bottle of ‘that’ for his friend. Then he leaned forward confidentially. - Did you ever discover or hear tell of mollycules? he asked. - I did of course. - Would it surprise or collapse you to know that the Mollycule Theory is at work in the parish of Dalkey? - Well… yes and no. - It is doing terrible destruction, he continued, the half of the people is suffering from it, it is worse than the smallpox. - Could it not be taken in hand by the Dispensary Doctor or the National Teachers, or do you think it is a matter for the head of the family? - The lock, stock and barrel of it all, he replied almost fiercely, is the County Council. - It seems like a complicated thing all right. The sergeant drank delicately, deep in thought. - Michael Gilhaney, a man I know, he said finally, is an example of a man that is nearly banjaxed from the operation of the Mollycule Theory. Would it astonish you ominously to hear that he is in danger of being a bicycle? Mick shook his head in polite incomprehension. - He is nearly sixty years of age by plain computation, the sergeant said, and if he is itself, he has spent no less than thirty-five years riding his bicycle over the rocky roadsteads and up and down the pertimious hills and into the deep ditches when the road goes astray in the strain of the winter. He is always going to a particular destination or other on his bicycle at every hour of the day or coming back from there at every other hour. If it wasn’t that his bicycle was stolen every Monday he would be sure to be more than halfway now. - Halfway to being a bloody bicycle himself. Had Sergeant Fottrell for once betrayed himself in drunken rambling? His fancies were usually amusing but not so good when they were meaningless. When Mick said something of the kind the sergeant stared at him impatiently. - Did you ever study the Mollycule Theory when you were a lad? he asked. Mick said no, not in any detail. - That is a very serious defalcation and an abstruse exacerbation, he said severely, but I’ll tell you the size of it. Everything is composed of small molecules of itself and they are flying around in concentric circles and arcs and segments and innumerable various other routes too numerous to mention collectively, never standing still or resting but spinning away and darting hither and thither and back again, all the time on the go. Do you follow me intelligently? Mollycules? - They are as lively as twenty punky leprechauns doing a jig on the top of a flat tombstone. Now take a sheep. What is a sheep only millions of little bits of sheepness whirling around doing intricate convulsions inside the baste. What else is it but that? - That would be bound to make the sheep dizzy, Mick observed, especially if the whirling was going on inside the head as well. The sergeant gave him a look which no doubt he would describe as one of non-possum and noli-me-tangere. - That’s a most foolhardy remark, he said sharply, because the nerve-strings and the sheep’s head itself are whirling into the same bargain and you can cancel out one whirl against the other and there you are – like simplifying a division sum when you have fives above and below the bar. - To say the truth I did not think of that. - Mollycules is a very intricate theorem and can be worked out with algebra but you would want to take it by degrees with rulers and cosines and familiar other instruments and then at the wind-up not believe what you had proved at all. If that happened you would have to go back to over it till you got a place where you could believe your own facts and figures as exactly delineated from Hall and Knight’s Algebra and then go on again from that particular place till you had the whole pancake properly believed and not have bits of it half-believed or a doubt in your head hearting you like when you lose the stud of your shirt in the middle of your bed. - Very true, Mick decided to say. - If you hit a rock hard enough and often enough with an iron hammer, some mollycules of the rock will go into the hammer and contrariwise likewise. - That is well known, he agreed. - The gross and net result of it is that people who spend most of their natural lives riding iron bicycles over the rocky roadsteads of the parish get their personalities mixed up with the personalities of their bicycles as a result of the interchanging of the mollycules of each of them, and you would be surprised at the number of people in country parts who are nearly half people and half bicycles. Mick made a little gasp of astonishment that made a sound like the air coming from a bad puncture. - Good Lord, I suppose you’re right. - And you would be unutterably flibbergasted if you knew the number of stout bicycles that partake serenely of the humanity. I saw a dramatic version of "The Dalkey Archives" at Aston University, in the late 1970s. It translated quite well from the page to the stage. But I can't remember the person who put together the stage version. Any ideas? a quick google search brings up Hugh Leonard as producing a stage adaptation in 1965, so that's probably it - though I don't personally know.